I'm a horror chick at heart but every now and then I do like to delve (sheepishly) into the world of literary fiction. 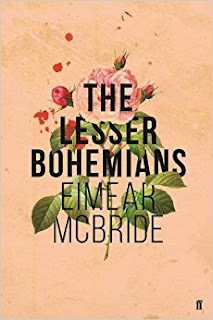 There's been so much praise for this book and of course for the writer, Eimar McBride who on an over crowded stage has invented an entirely new way of writing. Released just last year The Lesser Bohemians has won the James Tate Black Memorial Prize, long listed for the Bailey's Women's Prize, Goldsmith's Prize and the Bord Gais Irish Novel of the Year. The cover is gorgeous, simple but really eye catching. This book is quite unlike anything I have ever read before. The language reminded me a little bit of Ulysses by James Joyce. At first it was really hard to get into and to be honest a couple of times I gave up, but I persevered. Because there was something really compelling about the writing, half poem half prose, and after a while I got into it and then, I really got into it. It quickly became one of those books where I couldn't put, where I set my alarm clock earlier in the morning so I could spend more time with this delightful book. I actually felt a bit sad when it finished. Sometimes I get so involved with a book it is hard to say goodbye to the characters I've gotten to know so well. I'd love for there to be some sort of follow up as I felt like there is still a story to be told here. So this is written like a stream of conscious and I think its utterly genius because no one actually thinks in sentences, so in her writing we're truly inside the main characters head, thinking every she thinks, and you get really involved. I found the writing really moving as it feels so real. You feel like you're going through everything with her. So a bit about the book, set in London during the 90's, an 18 year old Irish girl comes to London enrolling in a drama course. Not long after she is introduced to the party scene and there she meets an actor twenty years her senior and already in the public eye. This story follows her transition from a simple country girl into a woman. She yearns for life, passion and adventure and to be free of herself. She soon becomes involved with this older guy. He's brooding and dangerous but she can't help herself. Although this is no glossy romance you'll find in the chick lit section. This is a real romance where each side is obnoxious and toxic, they hurt each other with their cruel games but yet each time they return to one another. It's a really raw honest writing about the truth of falling in love for the first time which is never perfect its often not the final love, as illustrated int his book through the other characters. Unless it is a pure sort of love that a father would feel for his child. As a writer I really admire McBride's boldness to write something so new and bold. There must have been quite a few moments where she questioned herself what she was doing. It was a risky book to write as it is so pioneering but it was a risk that has really paid off. She has also written another book, A Girl is a Half Formed Thing which I can't wait to get read.